A Sporty Vespa For A New Generation. The all new exciting Vespa Sprint 150 i.e. is being release this month! Colours are pure Italian with Rosso Dragon (red), Monte Bianco (white), Nero Vulcano (black), Blu Midnight (dark blue), Grigio Titanio (grey). If you are interested and want to find out more, give us a ring or drop in and see us as we can take pre-orders. The Vespa Sprint is set to strike a chord with the next generation of Vespa buyers and boasts new features not previously seen on the smaller Vespa body design. The Vespa Sprint is a true revolution with respect to previous Vespa small body generations. With the goal of guaranteeing the same ease and lightweight qualities of previous Vespa small frame range while setting new standards in terms of comfort, space, riding pleasure and safety. Vespa Sprint is a complete revamp of shape and size, picking up on the inspiration from the Vespa 946. The overall dimensions are still similar to those that marked the success of the Vespa LX however an increase in fundamental specific dimensions optimises the ergonomics, habitability and ease of use. The rider now has more legroom behind the shield and a new footrest that facilitates placing both feet on the ground, thanks in part to a new foot board design. Ease of handling is still ensured by the compact lateral size. Like the first prototype that inspired the name “Vespa” due to its similarity to a wasp the tail returns to its tapered pointed design and providing a streamlined appearance. Celebrated for the unique all steel construction and famous shape, Vespa is generally categorised by body size, small frame for the compact inner urban commuter and large frame for the higher capacity models. The small frame or ‘Vespino’ as they are known in Italy, offer a popular size compatible with inner city transport purpose. Sprints new body sees rigidity of the headstock increased 36%, while the longitudinal resistance to flex also significantly increased, advantages tangible in terms of safety and riding pleasure on the road, where riders will discover Sprints dynamic qualities for exceptional stability and handling. Sprint 150 is characterised by large diameter 12 inch rims ,the largest seen on a ‘Vespino’, and a new, sportier front end with Vespas new enhanced sliding suspension (ESS) designed to significantly improve road holding and rider enjoyment. Additionally distinctive styling, in reference to fashionable Sprints of the 60s and 70s with their trapezoidal headlight shape see Vespa again step away f rom the traditional round headlight and mirror design. A move in line with the popular trend of retro style complimenting modern technology. Vespa Sprint offers numerous bold aspects which strongly characterise the model and set it apart . The saddle has an exclusive design, enhanced by a strictly black covering with a white line finish. The convenient fold-away bag hook is retained, contributing to increasing the already significant cargo capacity of the Vespa Sprint. A new battery location sees under seat storage increase to a very generous 16.6 litres. A new engine mount system first introduced on Primavera is prevalent on the Sprint keeping vibration to a bare minimum. Safety and security include LED front day time lamps, engine immobiliser and side stand with engine safety cut out switch. 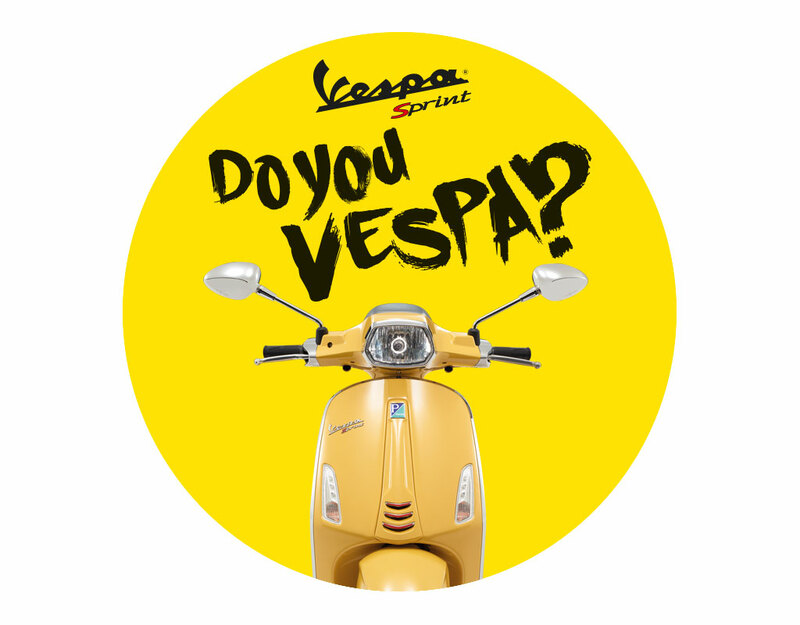 As always in the history of Vespa, the brand new Vespa Sprint offers a wide range of accessories to customise your vehicle and to increase riding comfort including screens topboxes and racks. Category leading 10,000 klm service periods and a standard 2 year unlimited klm warranty is applicable. For more information, check out our Vespa Sprint page by clicking here. Kindly inform me it has hand shift gear ?